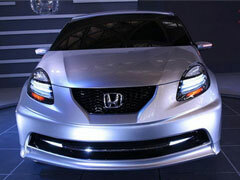 Honda has joined hands with Indian counterparts to introduce a new small concept car at the New Delhi Auto Expo 2010. Honda Siel Cars India Ltd. (HCSI) has unveiled their new joint venture product to benefit the needs of the vast Indian market. By newly developed technologies in the auto industry. The successful launching has encouraged Honda Siel Cars to go ahead with further plans for another new small concept debute in 2011 with a new model. The designers have produced a wide base car with a very stable centre of gravity. This car is designed with seating for five people. The favourable comment offered on the outlook is an “Efficient Energetic Exterior”. The front bumper gives the concept car a heavier look in spite of its compact size. The overall body presents a very stylish over do. Honda New Small Concept seems to push further plans for 2011 for introducing small-sized vehicle in developing markets like India and Thailand. These small scale auto shows help project small concept cars better. They intend to present more vehicles with technology based new features unknown in these markets and in budget pricing. The Honda global parts sourcing network will support the after sales service.